ToyDorks - Monograms - DC Comics - Set of 4 Interlocking PVC Figures - Batman Robin Wonder Woman & Superman. DC Comics - Set of 4 Interlocking PVC Figures - Batman Robin Wonder Woman & Superman. 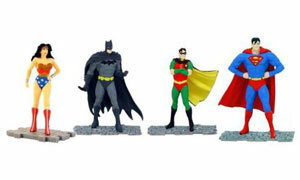 Description Of Item: DC Comics - Set of 4 Interlocking PVC Figures - Batman Robin Wonder Woman & Superman. All four of these great looking DC Comics PVC are made to interlock. Would be great stock stuffers, party favors or cake toppers.